Last edited by purpleGirl on Thu Nov 09, 2006 8:08 am, edited 1 time in total. Before the Chinese Paladin series came out, I've always wanted TVB to make a film on it... but now when I ask myself who should cast...I don't know...the CP ones match perfectly!! The cast are young, and its refreshing =) Most of the TVB casts are older..and pretend to be young...sometimes doesn't look right.. Most of the TVB casts are older..and pretend to be young...sometimes doesn't look right..
yeh..that's true too..but it still sorta works well..in some tvb series, it suddenly makes you go o_0??? when a character says 'I'm 16" XD XD ehehe.. 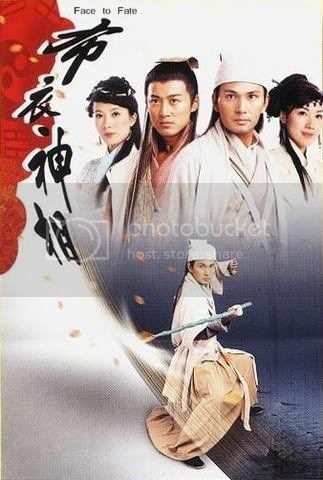 Here's the themevideo for Lofty Waters Verdant Bow, I think its pretty easy to see who are the 2 female leads..any guess who we're referring to? Indeed I am. I have a Chinese Digistal box set up at home which I can watch series, news etc from Hong Kong. If some series don't show up or take couple years before showing in England I rather download them than wait that long. I'm currently watching Face to Fate 布衣神相 and I love it xD XD Half way through (epsiode 15, 30 in total) can't wait to watch more!! I'm not enjoying: Maiden's Vow 鳳凰四重奏 very much though..